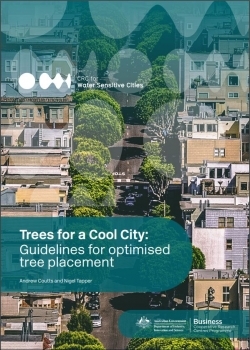 The CRC for Water Sensitive Cities has recently published 'Trees for a cool city', which provides guidelines on where to place street trees to achieve the largest cooling benefits for human thermal comfort. The document highlights how urban water management can achieve well-watered trees with healthy, shading canopies and explains where to place trees within the streetscape to maximise benefits. It sets out principles like smart planning and using existing trees, and describes how to prioritise streets for planting.